Co-opbank Persatuan was originally established and officially registered as a cooperative company on 7 June 1950, under the Cooperative Company Ordinance (1948) which is currently known as the Cooperative Act (1993). Its creation is the result of the merging of over 21 Village Cooperative Companies (Syarikat Kerjasama Kampung) in Bukit Mertajam, Penang. During its early establishment the newly created cooperative is known as "The Province wellesley Cooperative Banking Union Limited". In 1971, the cooperative opened its membership to both individuals and cooperatives. 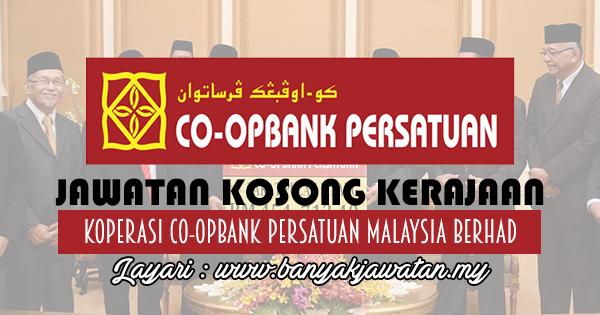 By 1981 its changed its name to Bank Persatuan Kerjasama Seberang Perai Berhad and only in 1995, Co-opbank Persatuan adopted its current name when it is changed to "Koperasi Co-opbank Persatuan Malaysia Berhad" or can simply be called Co-opbank Persatuan. 0 Response to "Jawatan Kosong di Koperasi Co-opbank Persatuan Malaysia Berhad - 21 Jun 2018"